I’m off to Richmond for a few days. It is in the outback where it is hot and dry. I’ve been there once before. We went to follow the dinosaur trail when the kids were little. The area is rich with fossils. When I was there last time we saw emus running along beside the road. It was noted by someone very observant that you can hear birds screeching in the background of my previous video. 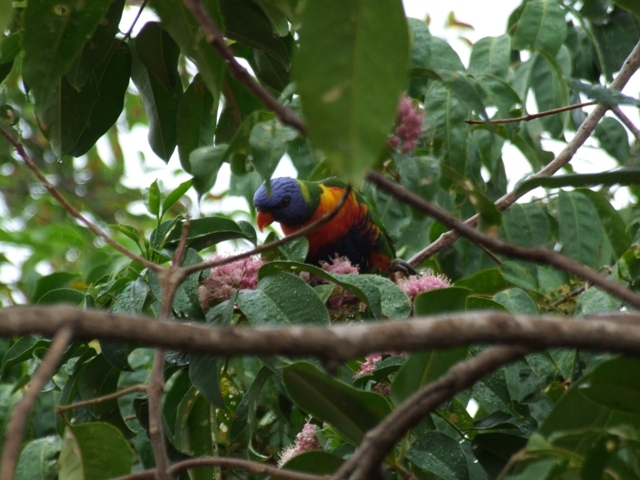 These are the lorikeets who make daily – and all day long – visits to our yard at this time of year. They feast greedily on the nectar in the blossoms of the Euodia and River Cherry trees that are native to this area of Australia. These trees also attract big, beautiful, bright blue butterflies and, at night…, they’re full of bats. 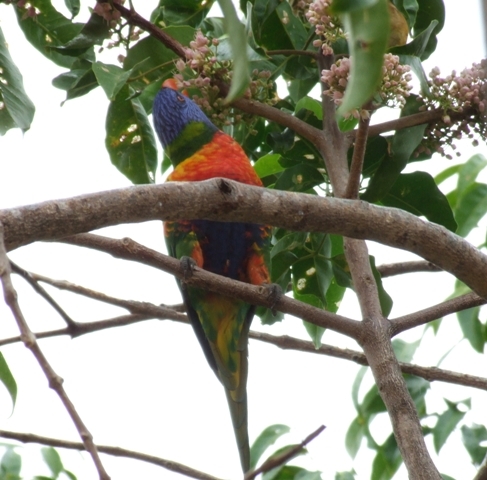 These birds are cheeky and noisy, they screech to each other from the front yard to the back yard. They generally ignore us and continue feasting and screeching if we are in the yard. I took a little video footage, but my ipod has no zoom, so you might have to watch it twice to actually see the bird amongst the glossy green leaves. I was standing right outside my front door when I took this video. In fact, right at the end you can hear my Pete open the door behind me. Now you can see why they are so noisy, even from inside the house! Philip and I made a video together. I talked and sewed and he filmed it. 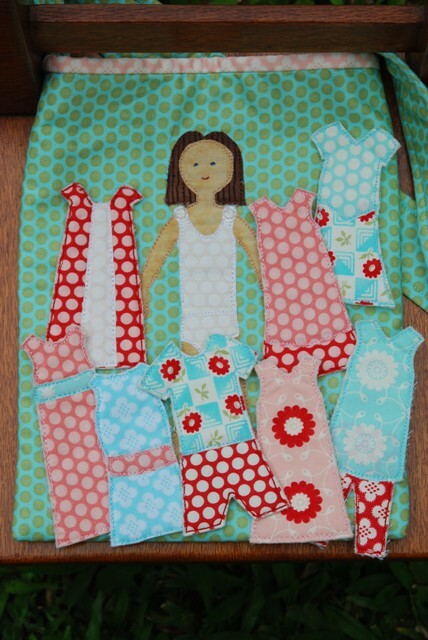 It’s a video to help with the making of the clothes for Millie Molly. Do you see a career for us in the DIY, home improvement and craft network? The video is posted in the Need Help? 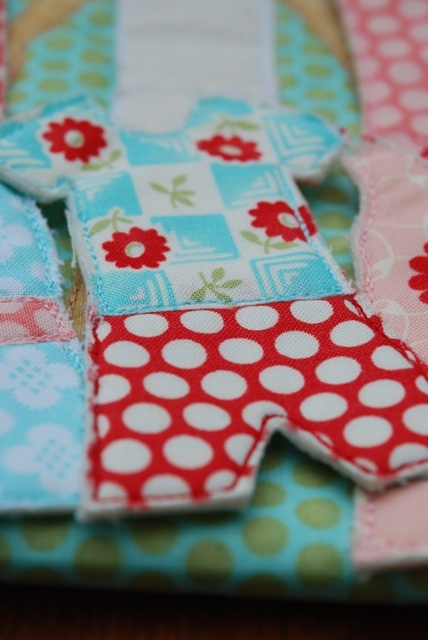 tab on the Peppermint Patch Quilts website. Oh, what a fabulous night I had! There were lots of people who came to see my quilts. People I knew, who came to offer their support, and people I had never met, who came just to see my quilts. I chatted to people, I spoke to the lovely Flo who surprised me with a call all the way from the UK and I made a speech which was funny and charming. I did not, however, remember to give Pip the camera during my speech, so you’ll have to just take my word for the funny and charming bit. Thank you to Kirsty for allowing me the opportunity to exhibit at Pompom Rouge. 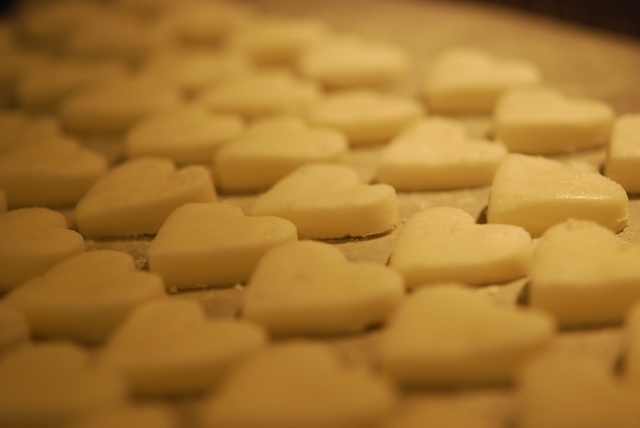 Thank you to Ashy and Pip who cooked and baked for days to prepare a delicious peppermint treat table. Thank you to my mother who did some stunt quilting for me in the last few weeks when it became obvious that I would not manage to get everything out of my head and into reality in time. Thank you to all of you for your ongoing support and encouragement. After the exhibition I was exhausted. Four weeks of frantic preparations and one night of nervous energy caught up with me all at once. It was the best kind of exhaustion. and organised Pip to make cupcakes. Tomorrow is the opening of my exhibit. I hope you can be there. I’d love to see you. 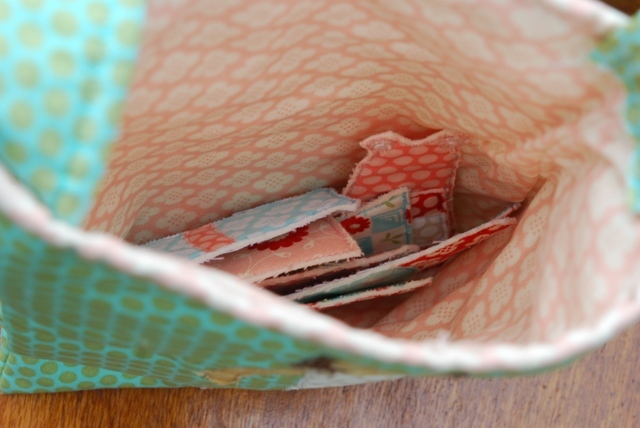 Well… today I do have a completed post to show you, although after the introduction Imogen gave to this pattern, I’m afraid it will be a let down. 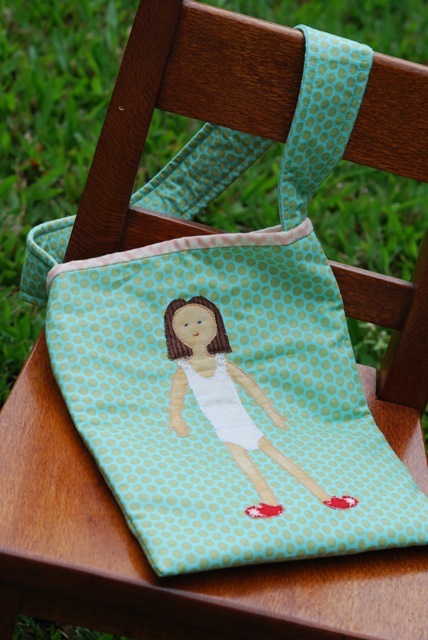 Here is the Millie Molly Dolly Bag. Peek inside to see her little outfits. Here they are laid out for show. I love the fabric range, called Bliss, that has been used to make them. It was the perfect choice. It’s girly without being too pink. You can’t begin to imagine how much I have enjoyed making these. 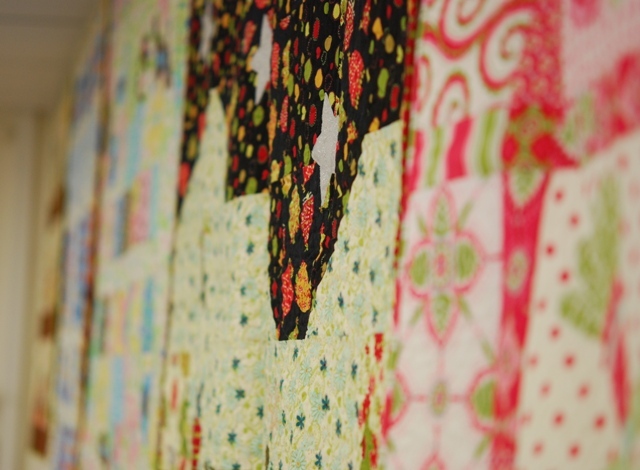 You can see more photos on the Peppermint Patch Quilts facebook page or on my flickr photostream. Generally I don’t do this. Usually I work hard to get all of the elements of a post together, then publish them all at once. Today I was bringing together the elements that I need to release my new pattern. I asked my niece to present this little bag to you. I thought it was a simple task. I didn’t fully appreciate how very seriously she would take it. After wardrobe selection and having her hair done we had a brief discussion about what I would ask of her, then I started the camera. I had expected a few takes, a few stumbles, a few nerves, but this is what I got on the very first take. It melts my heart and fills my cup with happiness.